Tag Archive | "speed-cleaning tips"
(BPT) – It’s no secret the holiday season can be one of the busiest and most stressful times of the year. What is one of the biggest sources of stress? It’s cleaning on a deadline, especially while guests are on their way. But with the right plan in place, even last-minute pre-entertainment cleaning can be efficient and stress-free, says Debra Johnson, Merry Maids home cleaning expert. In an online survey conducted this spring by Toluna, more than half of respondents admitted that most of their cleaning takes place just before guests arrive. With a bit more focus, this preparation can be quick and effective, without stress. After all, the holidays shouldn’t be a race against the clock. They’re about spending time with loved ones. Johnson shares the following tips to clean smarter, not harder, in the limited time you have before guests arrive. The important first step is to declutter rooms. Set a timer if needed to help you stay on track and avoid spending too much time in one room. Put things where they belong, or if they don’t have a home, put them in a room or under beds where no one will see. Once the holiday season passes, you can revisit and declutter those hidden storage areas. Prioritize rooms you use most, so if you run out of time, guests won’t notice an untidy area. Join the more than one-third of Americans who don’t bother cleaning rooms people won’t see. You have enough to stress about as the host. Don’t waste your precious time cleaning parts of the home no one will ever see. Simply shut doors to rooms that you want to keep private, signaling to guests not to enter. If you have family staying with you, give guest rooms a once-over, clean the bathrooms that will be used and, of course, the kitchen and living room. Don’t spend time sweeping with a dry mop when you can vacuum instead. Vacuuming is far more efficient and faster at removing dust, dirt and other debris from the floors. Keep a portable hand-held vacuum nearby in case a big mess happens, such as a glass breaking during a party. Within seconds, the mess will be gone and you can go back to enjoying the festivities. All you need to clean your bathroom quickly is a damp microfiber cloth to give every surface a quick wipe-down and a toilet brush to clean the inside walls of the toilet. To freshen it up even more, pour a half-cup of baking soda into the toilet bowl and add white vinegar along with a few drops of your favorite essential oils. Allow the mixture to bubble for a bit and scrub with a toilet brush. Then, voila: your bathroom is clean, shiny and smelling great. You know people will want seconds well after the leftovers are put away, so use this quick tip to tackle microwave build-up: Combine lemon juice and water in a microwave-safe bowl and run it for about two minutes. The lemon water will loosen any gunk or food in the microwave for an easy wipe down with a microfiber cloth. Now guests can reheat their leftovers in a clean microwave. 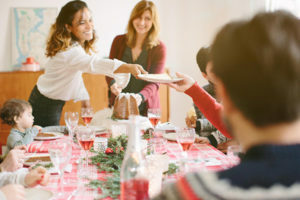 “Hosting a holiday dinner requires prep work, but if you stay on track before anyone arrives, you can spend more time actually relaxing and enjoying their company,” said Johnson. If you simply don’t have any time to spare this holiday season, Merry Maids has the resources and experts to help. Find a location in your area by visiting www.merrymaids.com. With the cleaning under control, all that’s left for you to do is to light a few candles, conquer the grocery list and, of course, enjoy your special guests.